The nasal valve is the internal aspect of the front the nose; where the greatest resistances to airflow normally occur. The BreathRight strips worn by football players on the field help to keep the nasal valve open during vigorous exercise. Although nasal valve collapse during vigorous respiration is normal, its collapse during normal breathing is abnormal and can results in nasal blockage, snoring, and mouth breathing. Patients with nasal valve collapse often pull up the cheek on the affected side to breath better. Nasal valve obstruction is an often-overlooked cause of nasal obstruction and may require nose surgery with cartilage grafting, for permanent symptom relief. The most common cause of nasal valve collapse is previous rhinoplasty; followed by nasal trauma and congenital weakness of the nose cartilages. Examination of patients with nasal valve collapse will show pinching of the nose and dynamic collapse of the nasal sidewalls during respiration. Individuals with previous rhinoplasty often manifest symptoms of an overdone nose job, including a pinched or over narrowed nose. Although internal or external stents can improve nasal obstruction from nasal valve collapse, they do not offer a permanent solution to the problem. The most appropriate treatment for nasal valve obstruction involves restoring structural support to this area of the nose. The nasal valve can be divided into an external and an internal portion. The external nasal valve is situated low in the nose in the nasal tip region. The internal nasal valve is higher, in the middle third of the nose. Surgical correction of one or both parts of the nasal valve requires cartilage grafting to add support and stability. In rare occasions, when the nostrils were excessively narrowed during cosmetic rhinoplasty, a composite graft of skin and cartilage is used to widen the nostril. 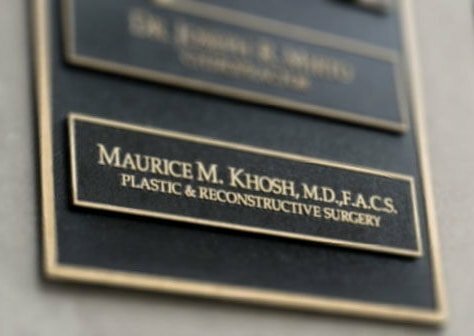 Dr. Khosh is an expert in diagnosis and treatment of nasal valve obstruction and nasal vestibular stenosis repair. He published one of the first scientific articles, in the Archives of Facial Plastic Surgery, pertaining to management of nasal valve obstruction. 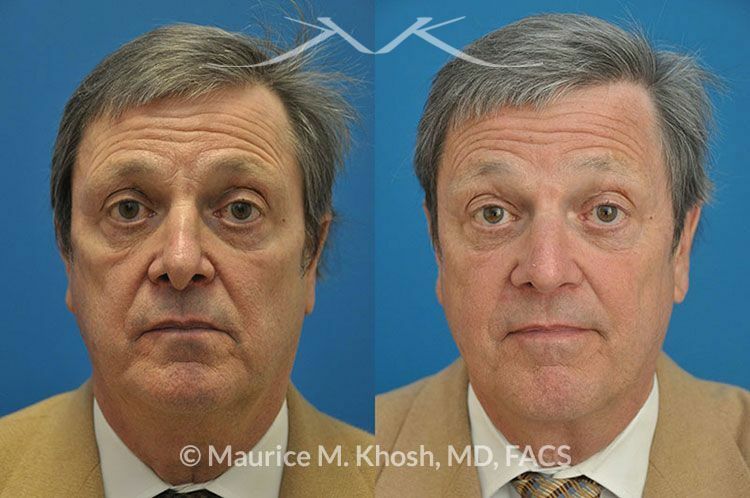 Dr. Khosh has lectured nationally and offered seminars on the “Prevention and treatment of nasal valve collapse during rhinoplasty”. If you suffer from nasal obstruction following rhinoplasty or nasal trauma, we invite you to contact us today to schedule a private consultation with Dr. Khosh, to learn about the cause and the treatment options. This 58-year-old requested consultation for repair of nasal obstruction following a prior rhinoplasty. There was evidence of internal and external nasal valve collapse, including pinched appearing lower nose, retracted nostrils, and excessive show of the columella. An open rhinoplasty approach and septum cartilage grafts were used for repair of the nasal obstruction. What kind of anesthesia is used for repair of nasal valve collapse? Surgical correction of nasal valve collapse can be performed under sedation or general anesthesia in an operating suite. Will repair of nasal valve collapse make my nose look ugly? No. In cases of severe nasal valve collapse, the “pinched” appearance of the nose is corrected after nasal valve repair. In cases where the nose is not “pinched”, nasal valve repair has minimal to no effect on the cosmetic appearance of the nose. What can be used for nasal valve repair, if there is no cartilage left in my nose? Nasal valve repair requires cartilage for structural support of the nose. If there is no cartilage left inside the nasal septum, ear cartilage, or rib cartilage may be used. What is a composite graft for repair of nasal stenosis? A composite graft is a generic term that describes a graft that has more than one component. In nasal vestibular stenosis, combination grafts of skin and cartilage can be used from the ear. This provides stability and tissue coverage for a narrowed region of the nose. What is a spreader graft for repair of nasal valve collapse? Spreader grafts in nasal reconstruction describe vertical bars of cartilage that are used to widen a narrow nasal dorsum. What is an alar batton graft in nasal reconstruction? Alar batton grafts are cartilage grafts that are placed horizontally or obliquely in the nostril region to stabilize and strengthen the lower part of the nose. Does insurance cover the cost of nasal valve repair? Since nasal obstruction is a medical condition rather than a cosmetic complaint, most insurance companies are obligated to cover the costs associated with its treatment. Some insurance companies have protocols that must be met before surgery is approved. Examples of such protocols include: trial of nasal sprays, CT scan documentation, and photographic documentation of the nose. How is repair of nasal vestibular stenosis (nasal valve repair) performed? Nasal vestibular stenosis repair is performed through the same surgical approaches that are used for rhinoplasty or nose job. Either the closed rhinoplasty or the open rhinoplasty approach provide exposure of the weak or unstable part of the nose. Cartilage grafts which are harvested from the septum, ear, or the rib are then meticulously placed to provide additional support for the nose. Who is qualified to perform surgery for nasal valve obstruction? 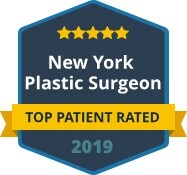 The most qualified surgeons are those who have a deep understanding of the anatomy and physiology of the nose, as well as extensive experience in performance of the surgery. 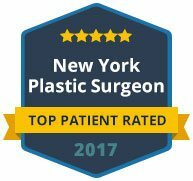 Dr Khosh is one of the few plastic surgeons nationwide who is an expert in diagnosis and treatment of nasal valve repair. He co-authored one of the first scientific publications on this subject in 2004. Nasal valve repair may necessitate septoplasty to harvest cartilage or address septum deviation. In cases where adequate cartilage is not available within the septum, ear cartilage can be harvested from behind the ear without affecting the shape or function of the ear. Occasionally, rib cartilage may be necessary for repair of nasal valve obstruction. When nasal valve collapse is a consequence of past rhinoplasty, revision rhinoplasty can be performed. In cases of trauma, repair of nasal fracture can be combined with nasal valve repair.